The Movement has begun! its a LOVE take over! The planet is in disarray, and people have lost the true meaning of Life. Money has become the new weapon and lust is its twin. Together they have deceived and manipulated this generation and have blackened our planet. Compassion is on a crutch crippled by the green monster. The moon is red reflecting the blood that's shed in the streets turning Gods creation into a wasteland of imbeciles draining your last bit of knowledge until your wisdom you think is wise. LOVE DONT LIVE HERE ANYMORE! Dig deep, let go and let GOD dig until you feel that compassion you felt long ago. Dig until you start to feel that what never mattered starts to matter even more. Dig deep for your brothers and sisters who have no voice. Dig deep down inside until you want to reach out your hands to help those who have lost hope. Don't live as if the only life that mattered is yours. Theirs no fear when God has given us courage and a sound mind. This doesn't have to be the end. 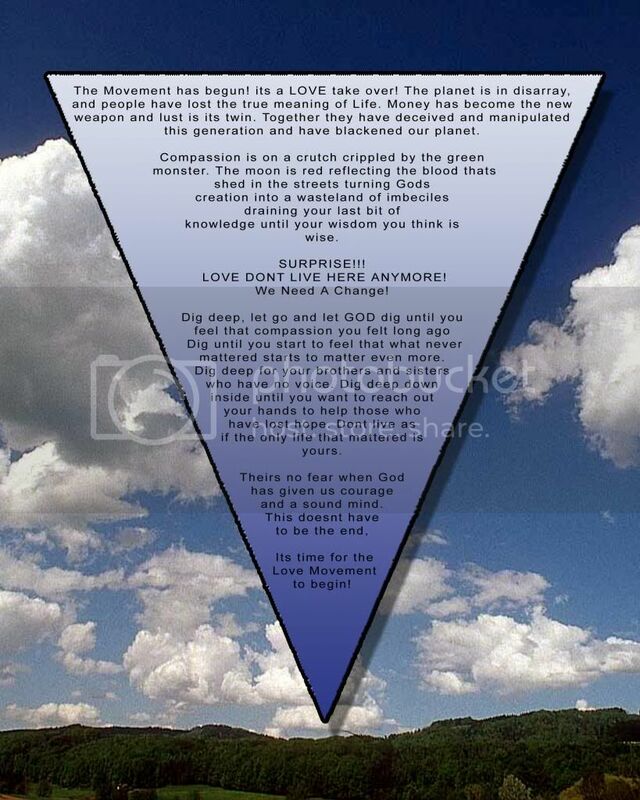 Its time for The Love Movement to begin!